Review: The story opens with Naila and her friends talking about dating, soccer games and prom. Things seem light-hearted even though readers know Naila’s parents don’t allow her to date. Then Naila’s parents find out about her secret boyfriend. From that moment on, this story is intense. There are a few times when Naila relaxes a little, but for the most part, she is trying to figure out how to get her life back under control. 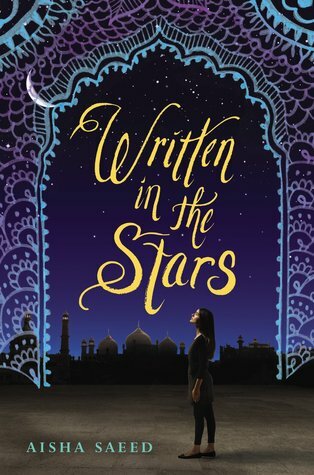 In Naila, Aisha Saeed has created a character who loves her family and wants to please them, but is trying to balance that with what she knows about herself and what she believes will make her happy. She truly tries to be a dutiful daughter. She studies hard, she does many things that they ask, but she fell for a boy at school. This leads to a star-crossed lover situation. It also damages the relationship with her parents. By going on the trip to Pakistan, Naila hopes to regain their trust. I appreciated that Naila makes the best of her situation. She has hope and decides to take this time in Pakistan as a gift. She enjoys getting to know her extended family and begins to understand some of the reasons why her parents love their home country. This was part of the book that I really welcomed. There are very few times that I hear about or see Pakistan in the media as anything other than a dangerous place surrounded by war. To see the everyday life of a family can help readers remember that there is more to Pakistan than what we see in the news. The sugarcane stalks and orange groves along with laughter of family members gathered together show Pakistan as a place in the world where people are living and loving. The story doesn’t end with the family reunion though. Naila’s parents have a plan and now it is they who break her trust. They’ve arranged a marriage without her input or consent. Naila’s trials have only just begun. What follows is a dangerous and frightening time for her. When I read in the summary, “Her only hope of escape is Saif,” I was worried that this would be a classic damsel-in-distress situation. I wondered if she even would try to help herself. This is part of the struggle though. She does want to please her parents, but she does not just give up and wait for rescue. She also makes an attempt to change her circumstances. I applaud Aisha Saeed for writing a beautiful book that also shines a light on the issue of forced marriages. As Saeed explains in the Author’s Note, she is Pakistani American and had a semi-arranged marriage. That meant her parents arranged it, but she and her husband-to-be did have some say in it. She made it clear that an arranged marriage and a forced marriage are two very different things. A forced marriage happens when one or more of the participants has little or no choice due to “coercion, pressure, threats, and sometimes, outright violence.” She also makes the point that forced marriages are not limited to any one race or religion, but happen all around the world. She wrote this story to give girls like Naila a voice. Saeed shares this story in a way that helps readers see how and why characters are making certain choices. The characters have some depth and aren’t all simply the good guys and the bad guys. It would have been easy for Saeed to paint the man Naila’s parent chose as an ogre and an awful person. He’s not perfect by a long shot, but he isn’t the embodiment of evil either. Life is complicated and messy because people are too. Recommendation: Get it soon – especially if you enjoy contemporary novels. This is a strong debut and I look forward to reading more from Aisha Saeed.